Powers/Abilities: After being exposed to an experimental nerve gas, Killgrave's skin, hair, and eyes turned purple. Purple Man saps people's wills, commanding them by verbal suggestions via pheromones secreted through his skin. Killgrave can subjugate as many people as are present in the range of his pheromones, even commanding large crowds, but his control gradually decreases over a period of time (different levels for different victims) as he departs the area. Individuals with high willpower (Daredevil, Dr. Doom, Kingpin, Cage) or altered metabolic processes (ionic beings such as Wonder Man and Atlas) can resist Killgrave's powers effectively, as can robots and non-organic beings. In addition, individuals can be telepathically rendered immune to his powers. Purple Man has been known to permanently alter the memories of others by ordering them to forget something. Under certain circumstances, Killgrave's powers have seemingly been amplified when he amplifies the decibels of his voice through technological means. Killgrave's powers are subject to his own state of consciousness and are known to be less effective when he is sedated, which has at times been done with sprayed chemical mists; when Purple Man's pheromones are blocked (by something like a plastic sheet), his powers can wear off immediately. Purple Man's enemies have been known to block his pheromones by wearing nostril filters and/or earplugs. Purple Man's pheromones have also been spread through the water supply before. Killgrave's body has also been mutated so that he is able to rapidly recover from injury, even healing himself from seeming death. When Killgrave seemingly returned from the dead, he appeared to have the ability to command other corpses to do his bidding and proved resistant to flame. Killgrave's men have used a purple will-deadening gas, a derivative of the gas that empowered Killgrave, to overcome the will of others. Purple Man has used various weapons, including armed helicopters. Dr. Doom was briefly able to use Killgrave's DNA to control the will of others through a small psycho-prism; he later powered a giant psycho-prism with Killgrave himself. Killgrave once built a machine in a power station that would expand his powers by placing his five children into purple crystals that expanded the range of his powers, much like the Psycho-Prism he had once built. (New Thunderbolts#10 (fb) - BTS) - As a spy for the former Soviet Union, Zebediah Killgrave smoothed his ways into corporations and associations and used his skills of manipulation at getting others to do what he wanted. (Daredevil I#4 (fb) ) - Killgrave snuck into an army ordnance depot to steal nerve gas. He shot a guard who saw him, but the guard's gun went off and the bullet broke a glass container full of purple nerve gas. The gas washed over Killgrave's body, turning his entire body purple. When the guards entered, Killgrave made up a pathetic excuse about being there and was shocked when the guards believed him. He soon learned of his power to control the wills of others by spoken commands. (Alpha Flight I#41 (fb) ) - In the early days of his criminal career, Killgrave forced a young American girl, Melanie, to marry him. When he later gave her back her will, professing true love for her, she rushed from him in horror. She later gave birth to his daughter, Kara, who would become the mutant Purple Girl (later Persuasion) with the same powers, though her powers would not develop until she was a teenager. (Daredevil I#4/Daredevil Yellow#6) - Purple Man waited in line behind Mrs. Perkins at the Bank of New York, then instructed Mr. Smathers to fill his briefcase with $100 bills. When Purple Man was out of range, Smathers called the police when he came back to his senses and Purple Man was arrested and taken to court. Matt Murdock was appointed to be Purple Man's counsel and, with his secretary Karen Page, met Purple Man at the holding cell. Purple Man liked Karen's looks and ordered the guard to release him, Karen Page to become his personal secretary, and Murdock to remain behind, then strolled away with Karen. When the costumed hero Daredevil approached, Purple Man was pleased to use his powers on a hero and tried convincing Daredevil that he was harmless. Daredevil proved resistant to Purple Man's powers, so he ordered the crowd, including the armed policemen, to attack him, then walked away with Karen, who suggested they stay at the Ritz. Purple Man went to a local gym and ordered all of the men there to act as his personal bodyguards. One man, Punchy, was resistant and threatened to harm Purple Man, so Purple Man had the others take Punchy down. He went to the Ritz Plaza Hotel and ordered the top floor evacuated. In his new suite, Purple Man decided to seize all power, knowing he would have to stop Daredevil to do so. As Purple Man furthered his plans, he ordered Karen to remove her clothing until room service knocked on the door. Daredevil swung into the room and fought off all of Purple Man's men. Purple Man took Karen and tried running, but Daredevil jammed the roof door open with his cane and kicked Purple Man out onto the roof. Purple Man ordered Karen to stand on the edge of the roof and to jump if Daredevil didn't follow orders. Purple Man drew a gun and granted Daredevil's wish to tell him of his origins before firing. 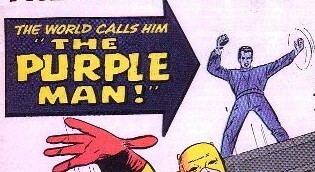 Daredevil then revealed that he'd recorded all of Purple Man's words and knocked the gun from Purple Man's hand. Purple Man was shocked when Daredevil grabbed Karen and jumped to a nearby scaffold, then Purple Man marched to the street and ordered Daredevil to be brought to him by the assembled crowd. The crowd starting closing in on Daredevil, who quickly threw a plastic sheet over Purple Man that blocked his powers. Purple Man was then arrested. (Daredevil I#88 (fb) - BTS) - Killgrave was kept in prison for months, where they nullified his powers with an aerial chemical mist. When a turbine shorted out, Killgrave easily escaped by commanding a guard to let him out. Killgrave slowly established a criminal empire for himself in San Francisco, where he commanded several criminals, including Chico, Bernie, and Renaud, to work for him. Though the Purple Man's powers didn't work from afar, the men still followed their orders. He developed weaponry, such as armed helicopters and purple gas that could sap the wills of others. He also started dating Lucy. (Daredevil I#88) - Killgrave and his men saw Daredevil on television being interviewed by Dave. Killgrave was furious and figured Daredevil was after him. Despite Chico's reservations, Killgrave sent he and the men out to pillage and ordered them to take care of Daredevil. They donned uniforms that would protect them from the gas. They sprayed the purple gas over the crowd at the Williams building and ordered them to stay back and immobile. Daredevil soon showed up and proved to be resistant to the gas. He lashed out at the villains just before Purple Man entered and ordered the crowd to attack Daredevil. Purple Man was shocked at how savage the crowd had become as they easily overwhelmed Daredevil, then he had Chico and the others load Daredevil on the helicopter, where Lucy waited. Purple Man told Daredevil how he'd escaped prison, then Ivan Petrovich tossed in a tear-gas grenade, blinding the others while he and Daredevil escaped. (Daredevil I#89) - Killgrave was furious when he heard about the capture of Chico and Bernie, and silenced Lucy's attempt to reason with him. When he heard about at-large criminal Electro (Max Dillon), he had Renaud, Raoul, and others seek him out. They boarded a helicopter with Electro on the front and found Daredevil and Black Widow, who easily defeated Electro. Daredevil boarded the craft, immune to the purple gas due to his nostril filters, and damaged the equipment. Daredevil then jumped free before the craft crashed. (Daredevil I#147 (fb) - BTS) - Purple Man started exercising his control over Maxwell Glenn, seeking to take over the board of directors of Glenn Industries. He made sure that Glenn would take the fall for any crimes committed. When board member Bernard Harris proved to be a problem, Purple Man ordered Stone, his aide, to kidnap Harris' daughter, Debbie. (Daredevil I#134 - BTS) - When Matt Murdock became suspicious of Glenn, Stone showed him away. (Daredevil I#137 (fb) - BTS) - Stone kidnapped Debbie Harris, fiancée of Franklin "Foggy" Nelson and daughter of Bernard Harris. (Daredevil I#137 - BTS) - Stone contacted Foggy and demanded his presence, without cops, at midnight that night. When Foggy showed up, Stone fired at him. 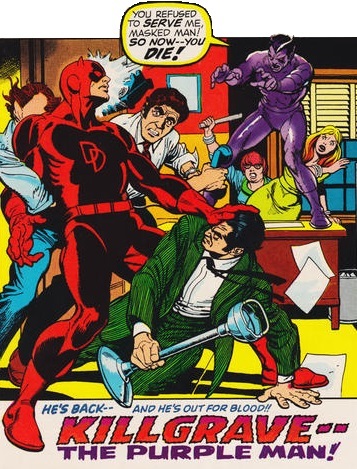 (Daredevil I#146 (fb) - BTS) - Acting under Purple Man's orders, Maxwell Glenn hired Bullseye to kill attorneys Matt Murdock and Franklin "Foggy" Nelson for a million dollars. The hit failed. (Daredevil I#141 - BTS) - Daredevil attacked Stone, who died during the battle. (Daredevil I#143 - BTS) - Maxwell was cleared for his crimes and Stone was blamed for it all. (Daredevil I#146 - BTS) - Bullseye told the authorities about Glenn. (Daredevil I#147) - Daredevil confronted Glenn, who admitted to his crimes. Before Glenn could be arrested, Purple Man ordered him to forget his crimes and their association. He then went back to the board of Glenn Industries, including Bernard Harris, reminding them of his authority, just as Daredevil attacked. 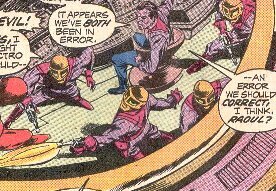 Even with his enhanced powers, Purple Man couldn't control the hero, so he ordered the 12 men to kill him. Daredevil shut off the lights and defeated the men, but Purple Man still managed to escape. (Daredevil I#153 (fb) - BTS) - Purple Man started hiding out at Ryker's Island Penitentiary, figuring no one would look for him there. He took control over Heather Glenn and forced her to call Daredevil, leading him into a trap where Mr. Hyde and Cobra waited, as Purple Man had let them out of prison and ordered them to kill the hero. (Daredevil I#153) - Mr. Hyde and Cobra defeated Daredevil and brought him back to Ryker's. Purple Man let them in and ordered them to kill the hero. (Daredevil I#154) - Purple Man controlled the inmates of Ryker's Island and held Heather Glenn hostage, forcing her to hold a gun to her own head. Killgrave ordered inmates Cobra, Mr. Hyde, Jester, and Gladiator to kill Daredevil, and he took a seat with Heather to watch the battle. When Paladin (hired by Mort Chisholm) arrived to help the hero, Killgrave tried putting the mercenary under his control, but Paladin managed to resist and hit Killgrave with a blast. After the four villains were defeated, Killgrave tried holding Heather hostage again, but Paladin shot the gun out of her hand. Killgrave ordered the rest of the criminals into action, then fled into a tower, trying unsuccessfully to blind Daredevil as he chased him. Realizing Daredevil must be blind, Killgrave leapt at the hero, but accidentally fell from the tower and into the ocean. (Marvel Tales II#100/2 (fb) - BTS) - Killgrave was later incarcerated via unknown means. In prison, Killgrave commanded the cops to forget he was there, and escaped. (Marvel Tales II#100/2) - Killgrave, in a caped costume, hid out in a desert base, plotting his revenge, until heroes Hawkeye and Two-Gun Kid stumbled in. He ordered them to kill each other as he watched with pleasure. Two-Gun Kid's horse distracted Killgrave, who released his control of the heroes, and they destroyed his base before running off. The heroes had to wonder if Killgrave only made them think they'd triumphed. (Marvel Team-Up Annual#4 (fb) - BTS) - After his last two defeats, Killgrave decided to only use his powers for personal gain, to live a life as a gentleman of leisure instead of a super villain. (Marvel Team-Up Annual#4) - When two men crashed into Killgrave's Rolls Royce and then tried to accost him, Killgrave ordered them to fight each other. Spider-Man then intervened, so Killgrave ordered him to hang from a light post and sing Elvis Costello songs. Killgrave noticed that the wreck had disrupted a drug shipment, but he just walked away. After returning to his room at the Plaza, Purple Man ordered the police officers that soon arrived to stand on their heads, then he retreated to Central Park. There, he ordered a young man to jump in the river while he took the man's date on a carriage ride, ordering the couple in the carriage, including Sue, to get out. He kissed the girl, and ordered her out of the carriage when learning she was bad at it. Assassin Heinrich Von Schnickel-Schnapp then jumped in the carriage with a gun. Killgrave nearly ordered the man to shoot himself, but had second thoughts. Spider-Man tried arresting them both, but Killgrave ordered him to take a flying leap, then had Heinrich take him to see the Kingpin. They talked briefly until Kingpin insulted Killgrave, who tried to leave, but Kingpin stopped him with a gunshot. Killgrave furiously ordered Kingpin to kill himself, but Kingpin proved resistant to Killgrave's control. Kingpin sent out his allies to lure his greatest foes into one giant trap. Later, J. Jonah Jameson introduced Killgrave as a speaker to a gathered crowd. Killgrave followed the Kingpin's instructions and called out Matt Murdock, nearly revealing he was Daredevil, who sent the crowd running by yelling fire. When Killgrave saw Power Man, Iron Fist, Moon Knight, Spider-Man, and Daredevil all assembled, he ordered the crowd to kill the heroes, who broke through the wall to escape. With the lights out, Killgrave, his voice amplified by the PA system, ordered Daredevil to come forward, and ordered the hero to drop his weapon and strangle himself. Moon Knight shocked Killgrave by punching him out, resistant to Killgrave's voice due to earplugs. Killgrave was later gagged and arrested. (Alias#24 (fb) - BTS) - Over the years, Killgrave committed dozens of atrocities, rapes, and murders, leaving behind multiple victims, such as Kim Rourke. In one event, Killgrave entered a Denny's for eggs and ate them in peace after he ordered over 30 patrons to stop breathing. (Alias#27 (fb) - BTS) - Killgrave once ordered a woman named Rachel Cameron to dance off a balcony during a party, and she died. (Alias#25 (fb) ) - When Killgrave got a bite to eat, he ordered the restaurant patrons to fight each other. When the super hero Jewel (Jessica Jones) entered, he ordered her to take off her clothes, but recanted and had her fight off a group of cops instead. He kept Jones captive for months, making her witness his carnality, cry, beg him for things, but never touching her. He lived in the Plaza Hotel, wasting months doing nothing. Several weeks later, with college girls in his room, he saw an article about Daredevil in the newspaper. Furious, he ordered Jones to put on her costume and seek out Daredevil or another hero and kill them. She rushed off to do his will, but was badly wounded by the Avengers before coming fully to her senses. Her months spent serving Killgrave's whims would haunt her terribly for years to come. (Marvel Graphic Novel: Emperor Doom) - While vacationing in French Polynesia, Killgrave forced a general and a mayor to serve and entertain him. He was soon captured by Victor Von Doom, who was able to resist Killgrave's powers. Using a psycho-prism powered by a strand of Killgrave's hair, Doom tested his ability to control others. He immediately had a giant psycho-prism that would be powered by Killgrave himself. The humiliated Killgrave was soon placed in the prism, shouting threats to Doom as he did so. 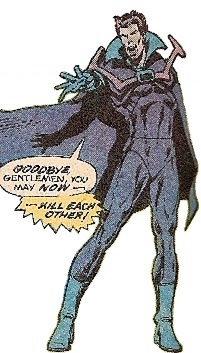 Doom stepped into the prism with Killgrave and removed his mask, proving it was his own will that protected him from Killgrave. Doom ruled the world for a time, but he was eventually defeated. When Namor destroyed the prism, Killgrave was believed killed. (Alpha Flight I#62 (fb) ) - Kara Killgrave visited the grave of her father, overcome with grief at having never known him. She spoke about how she wished he was alive again, then left for home. (Alpha Flight I#62) - Under the influence of the Dreamqueen, Killgrave burst out of his grave and thought himself a rotting corpse and immediately sought revenge on Melanie and Kara. He commanded other corpses to accompany him. Hours later, Killgrave and the zombies attacked Melanie's home, finding she, Kara, Laura Dean, and Goblyn inside. As Goblyn held off the corpses, Killgrave threatened to kill Kara, hating her for having power he didn't and for even being alive. He followed her down into the basement of the apartment building, where he briefly fought Goblyn before Kara knocked him into the furnace. He leapt free, on fire, before being consumed by the flames. (Jessica Jones: Purple Daughter#4 (fb) - BTS) - Killgrave discovered he had a son, Benjamin, who did not have the same mind-control powers as Kara. Benjamin felt like he was a great disappointment to his father. (X-Man#36 (fb) - BTS) - Seeking to wing back Melanie and Kara and to achieve world power, Killgrave thought of ways to manipulate the extremely powerful Nate Grey, a mutant who'd made a name for himself in Washington Square Park, in order to determine the limits of Grey's powers. (X-Man#35 (fb) - BTS) - Killgrave established an alliance with Flag-Smasher, who equipped his men to be the Destabilizers. Killgrave planned for this group to test Grey's powers in the future. (X-Man#34) - To test Nate Grey's powers, Killgrave a cab driver to crash into a motorcycle carrying Gregg and Jam. Gregg and the driver were killed instantly, but Jam was rushed to the hospital, where her arm was amputated. He later watched at Washington Square Park as Bux and Marita notified Grey of the accident, and Grey seemingly disappeared from there to the hospital. Nate stretched his powers to the limit to make Jam and others think Jam's arm had reformed. Dr. Marcus Arlington made the discover while nurse Laura Lanning, under Killgrave's control, watched. When she reported to him, he made her drink champagne with him, breaking her years of sobriety. Grey's fame spread and Killgrave gloried that he would be able to use the boy to get everything he ever wanted. (X-Man#35) - The Destabilizers attacked a game that Grey was attending and he single-handedly defeated them, bolstering his fame yet again. Later, however, the Destabilizers blew up at the police station, due to sub-dermal bombs that Flag-Smasher had secretly planted. Grey was blamed for the destruction and deaths and Killgrave was furious. With Bux as his forced chauffer, he had champagne with Flag-Smasher in the back seat and ordered his former ally to jump off a cliff. (X-Man#36) - Killgrave held Bux until Grey, who'd been struggling to escape the angry public, came looking for her. Grey furiously realized that Killgrave was behind his troubles and lashed out with telekinesis, unable to harm Grey, who was under Killgrave's power. As Killgrave orated about the power that would be his, he forced Grey to show him his past memories of his upbringing in an alternate universe. Grey soon found a way to block Killgrave's powers and Killgrave quickly escaped while Grey was distraught by the damage he'd done to the city around him. (Alias#26) - Jessica Jones was hired by several of Killgrave's victims, or members of the victims' families, to try and get Killgrave to admit his involvement in their murders. She approached Killgrave through a monitor to his room in the Raft and he called her a comic book character. (Alias#27) - Killgrave refused to acknowledge Jones' comments about his past crimes. Maddened, he continued talking about her life in a comic book and how he has helped scripted her over the years. Jones finally left in disgust. (Alias#27 - BTS) - Inspired by Jones, Killgrave used his powers to somehow escape from the Raft. He later showed up at the apartment of Jones' boyfriend, Scott Lang, and made her see him dead and covered in ants. (Alias#28) - Killgrave stood by while Jones screamed, but he ordered her to be silent, to see her worst nightmare, and for Lang to stay there quietly. He ordered Jones to accompany him down the street, where he ordered several civilians to fight each other to the death. As people died around them, Jones suddenly realized she could fight against Killgrave. When the Avengers (Black Panther (T'Challa), Captain America (Steve Rogers), Falcon (Sam Wilson), Iron Man (Tony Stark), Jack of Hearts, Ms. Marvel (Carol Danvers), Scarlet Witch, She-Hulk (Jennifer Walters), Sub-Mariner (Namor), Vision, Wasp (Janet Van Dyne), Yellowjacket (Hank Pym) ) approached, he ordered Jones to attack them, but she instead beat him into unconsciousness. (New Thunderbolts#12 (fb) - BTS) - Baron Zemo, manipulating the powerful twin moonstones, appeared in Killgrave's jail cell and presented Killgrave with a plan to take on the Thunderbolts. Zemo took Killgrave from his cell, making the guards see him there, and mentally tortured him into following Zemo's every whim. Killgrave was ordered to mess with the fledgling Thunderbolts team, making them splintered yet whole, heroes yet villains. Zemo had Killgrave's pheromones put into the city's water supply so that Killgrave could more easily manipulate the public when Zemo desired. Over the following weeks, Killgrave was constantly threatened by Zemo, who returned Killgrave to prison whenever he was displeased. (New Thunderbolts#4 (fb) - BTS) - At Zemo's suggestion, Killgrave started training and sculpting his new Swordsman, taking pleasure in his contradictions. He equipped him with weapons, pleasing Zemo. (New Thunderbolts#17 (fb) - BTS) - During his intense reprogramming and training of Swordsman, Killgrave did some horribly debasing things to Strucker. (New Avengers I#1 (fb) - BTS) - Killgrave was kept under sedation at the Raft for months. He had little contact with the outside world in his isolated cell, able to see his captors through a video screen. (New Avengers I#1) - Killgrave watched Matt Murdock, Foggy Nelson, Jessica Drew, and Luke Cage walk past his viewing screen. Later, Electro broke the entire group out of their cells. (New Avengers I#2) - As a battle erupted with the heroes, including Captain America and Spider-Man, Killgrave ordered Cage to kill the Avengers and then kill himself. (New Avengers I#3) - As Killgrave ranted about how fortune favored him, while he held an apple, Cage pointed out to him that he was still sedated and his powers didn't work. Cage savagely beat Killgrave until Captain America stopped him. (New Thunderbolts#1 - BTS) - When Captain Marvel (Genis-Vell), who possessed cosmic awareness, got involved in one of the Thunderbolts' battles, Killgrave ordered the hero to forget his powers. Captain Marvel was soon beat seemingly to death and tossed out to sea by a furious Atlas as Killgrave watched. (New Thunderbolts#2) - Killgrave monitored the Thunderbolts' affairs from afar and the news that Captain Marvel was still missing. He laughed with Swordsman about how no one yet knew the extent of their plans. (New Thunderbolts#3 - BTS) - At Killgrave's order, Swordsman confronted Baron Strucker, financial backer and enemy of the Thunderbolts. (New Thunderbolts#4) - From afar, Killgrave watched with mirth as Hydra's new killing machine, Wolverine, fought through Hydra agents to fight Baron Strucker, who was already fighting Swordsman. While orating to himself about control and artistry, Killgrave laughed to himself about the Thunderbolts' bolstering roster and grew angry at these "characters" trying to "write themselves". After Swordsman's deadly battle with Wolverine, Killgrave made Swordsman bow before him, commenting on how he'd controlled waitresses as he ate his breakfast and dinner. (New Thunderbolts#6) - Killgrave toasted himself on the Thunderbolts public defeat of Hydra and the return of Captain Marvel, now calling himself Photon. He rejoiced at their inevitable fall. (New Thunderbolts#7) - With a few women at his side, Killgrave watched a news report on the Thunderbolts and ordered Swordsman to prepare for battle. (New Thunderbolts#9) - Killgrave approached Songbird in her college dormitory, took control of her, ordered her to stop inquiring about what had happened to Photon, and ordered her to remove her clothes. Suddenly, Killgrave was seemingly stabbed through the middle by the Swordsman. (New Thunderbolts#10) - Killgrave, unharmed, ordered dozens of civilians to pursue Songbird and Swordsman across the city while he stayed in the dorm room with three coeds. While Code Blue moved in on the heroes, Killgrave disrupted Songbird's powers with a device taken from the Tinkerer. He manipulated the Thunderbolts into fighting each other and the city into turning against them and he rejoiced in seeing them get what was coming to them. As the Thunderbolts started figuring out that Killgrave had poisoned the water supply with his pheromones, Swordsman struck, stabbing MACH-IV through the chest and cutting Photon's throat. But Killgrave was shocked as a wave of reality washed over him, overwriting the entire world as the House of M.
(New Thunderbolts#11) - In the House of M reality, Killgrave was a lobbyist appointed to aid the mutant government's communications with the Kree Empire. Killgrave continued manipulating and exploiting the situation even without his powers, gladly playing the part of the puppet. (New Thunderbolts#12) - As reality returned to normal, Killgrave continued his plot against the Thunderbolts. He ordered Justice, Firestar, and Dr. Spectrum to attack Songbird, Photon, and Blizzard, commanding his victims through special rifts created by Zemo. He worried that the heroes were getting too close to the truth. When Songbird was nearly killed, but Atlas reincorporated at that moment (after being defeated for days by Swordsman) and saved her, frustrating Killgrave as he couldn't predict it. Killgrave ordered multiple super humans, including Wizard, Namorita, Spider-Woman, Nova, and the Vulture, to take them down. Despite relying on Captain America's tactical knowledge and insight, Killgrave still lost track of the Thunderbolts. When Joystick broke into the Baxter Building, Killgrave ordered the FF to attack her, who he and Zemo had gained control over by opening spatial rifts into their water faucets. Based in Avengers Tower, where Spider-Woman tended to him, Killgrave was furious when Joystick got the better of the FF. He demanded Captain America and Overmind, who he was using to telepathically monitor the city, to keep searching for ways to stop the Thunderbolts. Photon finally discovered Killgrave's location with his powers and the Thunderbolts soon attacked, even as Captain America searched for ways out of Killgrave's control. To keep the Thunderbolts away, Killgrave ordered civilians everywhere to jump to their deaths, so that the heroes would be forced to save them. As Killgrave fled, Photon caught him and forced him to see his true place in the universe, a mite of dust among the billions of planets and lives out there. Before the Thunderbolts could do anything else to Killgrave, Zemo retrieved him through a spatial portal. (New Avengers I#4 (fb) - BTS) - Killgrave managed to escape the Raft in the ensuing chaos. (Civil War: Choosing Sides#1/4) - When USAgent tried hunting down Purple Man in Philadelphia, Killgrave turned USAgent's own SHIELD allies against him. Killgrave took over USAgent's mind on a transport ship and made him jump, allowing Killgrave to easily escape. (Super-Villain Team-Up: MODOK's 11#1 (fb) - BTS) - The Purple Man took over a casino in Reno, Nevada, forcing the workers of the casino to be loyal to him. (Super-Villain Team-Up: MODOK's 11#1) - When the telepathic Mentallo began using his powers to succeed in poker, Purple Man had his men bring him in for questioning. 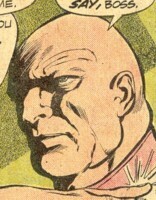 Mentallo, held at gunpoint, proposed a team-up with Purple Man, but he refused and ordered Mentallo killed, but Mentallo used his powers to escape. (New Avengers I#35) - Purple Man attended a meeting held by the Hood, who offered twenty thousand dollars to dozens of criminals to join his gang. To show his power, he defeated Tigra. (New Avengers Annual I#2) - The Hood's gang attacked the New Avengers (Luke Cage, Dr. Strange, Echo, Iron Fist, Ronin, Spider-Man, Wolverine) for revenge on a failed criminal enterprise. The villains were defeated when Strange invoked a deadly magic spell. (Thunderbolts II#147) - During a prison break at the Raft, where Luke Cage was now warden, Purple Man ordered a group of inmates to attack Cage. After the inmates were defeated, Purple Man tried controlling Cage's mind only to learn Cage had nannites protecting his brain. Cage headbutted Killgrave and returned him to his cell. (Fear Itself: Homefront#2/3) – During a mass breakout from the Vault, Purple Man felt his powers return, and he swam for freedom, wondering about the opportunities of his life. (Heroes for Hire IV#9) – Purple Man returned to the crushed Raft to kill the Puppet Master, bragging about his accomplishments from inside the jail. When Shroud and Elektra attacked, the prisoners under Purple Man's control surrounded them. (Heroes for Hire IV#10) – Purple Man taunted Misty Knight, who was communicating with the heroes through a comm-link, as Shroud and Elektra fought the inmates. When Shroud used his powers to block Purple Man's sight, he put the heroes under his command and ordered Elektra to kill Shroud. (Heroes for Hire IV#11) – Purple Man taunted Elektra, but noticed she was hesitating, and she soon attacked him, knocking him out. She told Shroud that she'd avoided his powers by holding her breath. Purple Man fled while they were distracted, but the Raft was crashing down around him and he fell into the ocean with a crashing wall. He later washed up on the far shore, laughing that he'd made it to New York, free. (Villains for Hire .1) – Purple Man, ruminating on how his Heroes for Hire project failed, decided to start a new project. He had Headhunter organize a list of villainous candidates for him, and asked her to contact the Mole Man about an operation. (Villains for Hire#1) – Purple Man and Headhunter had Shocker knock out power in parts of New York City, Avalanche shanghai a truck, and a new female Death-Stalker kill the guards. Tiger Shark, Bombshell, and Crossfire attacked to steal the truck, and Death-Stalker was seemingly killed. An angry Purple Man turned the chair over to Headhunter for the back-up plan. They sent Scourge (actually Paladin undercover) to follow up and the revived Death-Stalker tried stopping Nightshade from picking up the others, but Nightshade was a robot and her helicopter blew up. They retrieved the truck, which was full of collected police evidence, including numbers to Maggia bank accounts. Purple Man refused to believe Misty Knight was behind it. (Villains for Hire#2) – Purple Man and Headhunter hired Bushmaster and Monster to join their team and they sent them with Death-Stalker to retrieve Adamantium chips that Purple Man planned to interface with AIM and Hydra with, but Misty's operatives Bombshell, Lady Stilt-Man, and Speed Demon escaped with them. He had Headhunter and Shocker draw Tiger Shark and Bombshell in and he hired them to give him intel, though they didn't know who their handler was. He had Scourge stake out Misty, and they saw her shoot down Paladin. (Villains for Hire#3) – Purple Man sent Tiger Shark, Shocker, Avalanche, Monster, Bombshell, Scourge, Death-Stalker, and Bushmaster to Misty's headquarters, where Lady Stilt-Man, Crossfire, Speed Demon and the new Man-Ape. During the massive fight, they convinced Lady Stilt-Man and Man-Ape to join Purple Man's side; Crossfire was shot down, and Tiger Shark savagely ripped off Misty's cybernetic arm. Purple Man and Headhunter revealed themselves just as they learned Puppet Master was behind Misty's actions. (Villains for Hire#4 (fb) ) – Scourge confirmed Paladin's death. (Villains for Hire I#4) – Puppet Master briefly asserted control of the villains, but Purple Man and Headhunter countered them. The villains savagely battled, many escaping, and Scourge was revealed as Paladin all along. The villains that remained, including Purple Man, were arrested, and Puppet Master turned himself in. (Daredevil IV#8 (fb) - BTS) - Purple Man, wanting a family of his own, decided to reclaim children that he had fathered, hoping for a more sincere kind of love. He took the children, who took his powers on and their skin turned purple, including Joe, Connor, Shallah, and one more. (Daredevil IV#8) - Purple Man and the kids claimed another kid, Jamie, and ordered his mother Lahni (who Purple Man had raped in the past) to kill herself. The kids, together, experienced greater power and ordered Purple Man to walk in front of an oncoming bus. (Daredevil IV#9) - Purple Man woke up in the morgue. Bloody and battered, he found Daredevil battling the Purple Kids. (Daredevil IV#10) - Purple Man was beat back by Daredevil, then found the Purple Kids at the arcade Rough-N-Tumbles. He tied some of the kids up before Daredevil attacked, beating Killgrave (who tried to make DD have a heart attack) and drowning out his abilities with loud music. The police arrested Killgrave, and the Purple Kids were separated and placed into different foster homes, their abilities waning once apart. (Daredevil V#18 (fb) ) - Purple Man turned an orchestra into a bloodbath. 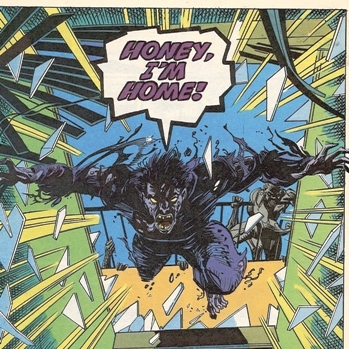 In prison, a guard named John wanted Killgrave to use his powers to convince Melissa to love him, but Killgrave had Melissa kill John instead, then free him. (Daredevil V#18 (fb) - bts) - Purple Man built a machine in a power station that would expand his powers by placing his five children into purple crystals that would expand his powers. He captured three of his children, but Joe and Shailah escaped, so he sent a mob after them. (Daredevil V#18 (fb) ) - Joe and Shailah led Daredevil back to him, and Killgrave easily took over both them and DD. (Daredevil V#19 (fb) ) - Killgrave forced Daredevil to dream about his own demons, demanding to know what the worst thing he could possibly do was. Kirsten McDuffie entered the room. Killgrave accessed the machine that the purple crystals were connected to, which would briefly allow him to control the entire world's populace, and planned to use it to bring Daredevil pain, but DD instead overcame Killgrave's control and badly beat him and freed the Purple Kids. (Daredevil V#20 (fb) ) - Purple Man lay bleeding as the Purple Kids loaded him into his machine then used his powers to make the world forget Daredevil's identity. The Kids destroyed the Psycho-Prism, then left Killgrave to be arrested. (Daredevil V#6-7 (fb) - bts) - Killgrave escaped from jail. He implanted false memories in Elektra's brain and sent her after Daredevil to taunt him. Daredevil would later realize Killgrave still knew his secret identity. (Unbeatable Squirrel Girl Beats Up the Marvel Universe#1) - Purple Man was among the villains defeated by the clone of Squirrel Girl (Allene Green) and confined in the Negative Zone; she shrank him down to ant-size to defeat him. (Jessica Jones I#12 (fb) – BTS) – Purple Man escaped custody and successfully evaded S.H.I.E.L.D. for over a year. (Jessica Jones I#13) – At Sea World, Purple Man ordered civilians, including Miley, to vacate the park. Later, he took over the mind of Danielle Cage, to confront Jessica Jones and Captain Marvel. (Jessica Jones I#14) - Purple Man taunted Jessica Jones through Danielle Cage, releasing the toddler shortly. After giving Jessica time to put her affairs in order, Purple Man met with her at Hauser's Bakery. (Jessica Jones I#15) - At Hauser's Bakery, Purple Man berated Jessica for her life choices, then he told Jessica she knew him best and he wanted her help to change. From across the street, Captain Marvel and Nick Fury II hired Kraven the Hunter to shoot Kilgrave through the chest, then Jessica beat his body for a time, but Purple Man, reminding her of his inability to die, commanded the nearby crowd to attack Jessica and get her off him. Killgrave escaped, then began talking to Jessica through the crowd, including Captain Marvel. (Jessica Jones I#16) – Killgrave, controlling Captain Marvel, ordered Jessica to listen, and he caused a group of civilians to riot when she initially wouldn't listen. Killgrave took Jessica to the ruins of Alias Investigations, where Killgrave shared his theory that he might be a new form of god, and Jessica tried to convince him that he could be doing good with his powers. Killgrave released Captain Marvel and returned in his own body, still shot. Feeling sorry for himself, Killgrave told Jessica he wanted to make the world a better place, and that he would do whatever she said. (Jessica Jones I#17) - Jessica Jones considered influencing Killgrave to use his powers to make the world a better place, but she knew it would corrupt her, so she refused his offers. Killgrave tried apologizing, but Jessica demanded that he leave. Captain Marvel attacked, but Killgrave left the room willingly and collapsed in the road, seemingly giving up his own life. Captain Marvel later stated that she had thrown Purple Man's body into the sun. (Jessica Jones: Purple Daughter#6 (fb) - BTS) - Before Killgrave was taken, Benjamin took his father captive instead, and he let the Purple Kids make Captain Marvel believe that she'd killed Killgrave. Benjamin kept Killgrave in a coma for months. (Jessica Jones: Purple Daughter#4 (fb) - BTS) - Benjamin discovered how to mix Killgrave's blood with his own and then inject it into others, or use it in a gaseous form, to mind control other people for temporary amounts of time. (Jessica Jones: Purple Daughter#6 (fb) - BTS) - Benjamin learned that if he mixed too much of Zebediah's blood in, the mixture would turn people's skin purple, so he altered the batches. While Benjamin was sleeping one night, Killgrave took control of a delivery man and had him inject Danielle Cage with the serum in a park while she played so that it would turn her skin purple. Desperate, he assumed Jessica would investigate and find him no matter what, liberating him from his condition. (Jessica Jones: Purple Daughter#4) - Jones fought her way through several mind-controlled civilians, as well as Luke Cage, and she found Killgrave in a hospital bed with Benjamin withdrawing his blood. (Jessica Jones: Purple Daughter#5) - Benjamin Killgrave kept Jessica and Luke in a fever dream where he made them appear as his parents, with Purple Man as Killer the dog. Killgrave broke through the illusion and convinced Jessica to let him take over her form so he could get revenge. Killgrave began to beat Benjamin in Jessica's body. (Jessica Jones: Purple Daughter#6) - In control of Jessica's body, Killgrave badly beat up Benjamin until his son revealed that Killgrave was responsible for Danielle's condition. Killgrave admitted the truth as Jessica screamed in pain and fury. Killgrave continued trying to force Jessica to kill Benjamin, who was using Luke Cage to defend himself. Jessica threatened suicide, forcing Killgrave out of her body. Purple Girl and the Purple Kids defeated Benjamin and released his victims, including Emma Frost. Benjamin escaped, but Jessica and Captain Marvel sent Killgrave to the Raft. Comments: Created by Stan Lee, Joe Orlando, and Vince Colletta. There are a few minor discrepancies between Daredevil I#4 and Daredevil Yellow#6. Daredevil poses as room service in one and comes through the window in another. Purple Man orders Karen to jump from the window in one and the roof in the other. I fault Murdock's sketchy memory for the mistakes in Daredevil Yellow. The Purple Man received profiles in OHOTMU I#8, the Deluxe Edition #s 10 and 19, OHOTMU: Daredevil 2004, and the recent Hardcover#10. (Daredevil I#89) - When Killgrave ranted about the capture of his men, Lucy tried reasoning with him, but he ordered her to stop thinking and leave him alone. Just then they heard about another villain at large, Electro (Max Dillon). 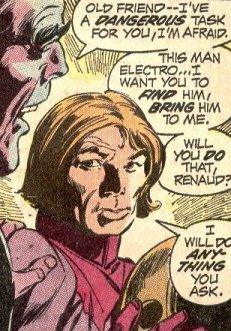 He enthusiastically sent Renaud out to find Electro. Killgrave and Electro were soon defeated by Daredevil. (Daredevil I#88 (fb) - BTS) - Chico and other criminals came under the influence of Killgrave, the Purple Man, who slowly established a criminal empire for himself in San Francisco. Though the Purple Man's powers didn't work from afar, they still followed their orders. He developed weaponry, such as armed helicopters and purple gas that could sap the wills of others. 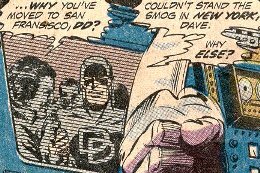 (Daredevil I#88) - Killgrave and his men, including Chico, saw Daredevil on television being interviewed by Dave. Killgrave was furious and figured Daredevil was after him. Despite Chico's reservations, Killgrave sent he and the men, including Bernie and Renaud, out to pillage and ordered them to take care of Daredevil. They donned uniforms that would protect them from the gas, bidding Killgrave and his girl Lucy farewell. They sprayed the purple gas over the crowd, including Mister Fiswell and Regina, at the Williams building and ordered them to stay back and immobile. The crowd had no choice but to obey. Bernie was continually nervous about Daredevil, especially when the hero showed up and proved to be resistant to the gas. Daredevil lashed out at the villains just before Purple Man entered and ordered the crowd to attack Daredevil. Purple Man was shocked at how savage the crowd had become as they easily overwhelmed Daredevil, then he had Chico and the others load Daredevil on the helicopter, where Lucy waited. Purple Man told Daredevil how he'd escaped prison, then Ivan Petrovich tossed in a tear-gas grenade, blinding the others while he and Daredevil escaped. (Daredevil I#89) - Chico and Bernie tried to escape, but Daredevil chased their helicopter around the bay and snared it with his billy club. 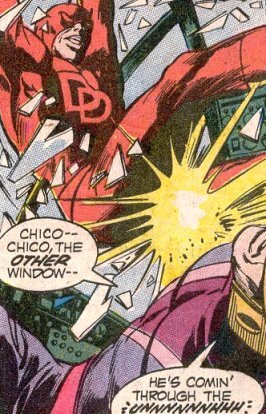 Chico fired his gun, trying to dislodge the hero, but Daredevil kicked his way into the craft and knocked them out. Daredevil jumped free from the copter before it crashed in the bay. Chico and Bernie were picked up by the police. (Daredevil I#88) - Daredevil was interviewed for television by Dave in San Francisco. (Daredevil I#88) - Mr. Fiswell and Regina were among the crowd at the Williams building in San Francisco when the Purple Man's agents, including Chico, Bernie, and Renaud, attacked. They sprayed purple gas over the crowd, forcing them to stay immobile while they fought Daredevil. The crowd was soon ordered by Purple Man to attack Daredevil, and they quickly defeated the hero. (Daredevil I#88) - Bernie and Renaud were among the men ordered by Killgrave, the Purple Man, to follow Chico in attacking Daredevil. They donned uniforms that would protect them from the gas, which would sap the will of others, bidding Killgrave and his girl Lucy farewell. They sprayed the purple gas over the crowd, including Mister Fiswell and Regina, at the Williams building and ordered them to stay back and immobile. The crowd had no choice but to obey. Bernie was continually nervous about Daredevil, especially when the hero showed up and proved to be resistant to the gas. Daredevil lashed out at the villains just before Purple Man entered and ordered the crowd to attack Daredevil. Purple Man was shocked at how savage the crowd had become as they easily overwhelmed Daredevil, then he had Chico and the others load Daredevil on the helicopter, where Lucy waited. Purple Man told Daredevil how he'd escaped prison, then Ivan Petrovich tossed in a tear-gas grenade, blinding the others while he and Daredevil escaped. (Daredevil I#89) - Renaud was sent by the Purple Man to recruit Electro (Max Dillon). Renaud found him in time and was nearly fried before Electro agreed to follow him to Killgrave. Electro, Renaud, and the others, including Raoul, boarded a helicopter to attack Daredevil, but the hero and Black Widow (Natasha Romanova) managed to defeat Electro and board the craft. Daredevil soon jumped free just before the craft crashed.